We are delighted to announce that booking for the 2019 Convention is now open. Click HERE to book.. Event to include a Competitive Exhibition, Guest Speakers and Trade Stands. The March edition of the OMRS Journal is out now and is packed with great articles. If you haven't received your copy contact the Membership Secretary. The March Britannia Medal Fair saw a busy Society table with the launch of 'For Faithful Service', Paul Brewster's new book on the Special Constabulary Long Service medal. The Honours and Awards Sub-Committee is accepting proposals from members to honour members who have made a significant contribution to the Society and to realising its aims. 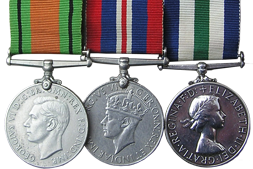 Our Society exists to promote a general interest in the study of orders, decorations and medals and to actively encourage and publish research into all aspects of civil and military medals, with a particular focus on those issued by Great Britain and the Commonwealth countries. Members’ interests range from awards for gallantry in battle, or bravery in saving life, through forgotten wars and far-flung campaigns, to long and meritorious public service away from the limelight. Research interests stretch from pure numismatics, through the military or social history surrounding the circumstances of awards, to the genealogy of the medal recipient.